Here's what the week brought to jazz fans. Well, I made a table to organize my thoughts. The first section is interesting. Like most tenor players - well, I don't play anymore - I've always thought of Ben Webster, the fellow who played tenor for some many years for Duke Ellington, as one of the best. I wanted to play like him. Big sound, not a lot of flash, great expressiveness and melodic sense. But alas, I was mediocre at best. I'll investigate these down at the Virgin Megastore on the corner. Charlie Parker? Sure. And Charlie Rouse is one fellow with a sense of humor, to match his flawless technique. Dexter Gordon is fine, and since the movie with him ('Round Midnight) everyone knows that: solid, clear, clean and thoughtful. Eric Dolphy is another matter - I don't want to spend a whole lot of time with him out on the edge of musical sense. I'm too old for that stuff. Lee Konitz, Chet Baker, and Gerry Mulligan from 1963? Okay. That should be interesting - three different flavors of West Coast Cool. Pharaoh Saunders is in town all the time, and I'll catch him if they ever reopen the Catalina. Sonny Stitt? - More ideas flying by faster than I can imagine playing those figures, and they all make sense. Amazing. When the fellow with whom I studied reeds as a teenager heard someone like Stitt, he would say that anyone can make his fingers go fast, so work on your tone. Yeah, yeah. Jerry Levine was a Julliard guy who played under Steinberg with the Pittsburgh Symphony. What did he know? And Stanley Turrentine. Well, he's solid, in a commercial way. Harmless. Sometimes really fine. Wayne Shorter. Yes. I'll listen to him. As for the recycled stuff, well, Art Blakey always works for me. Often all grove and no substance, but who cares? Early Benny Goodman? Of interest, if only to see how the engineers can clean up pre-1930 sound. Bix Beiderbecke? Someone everyone says they listen to, and no one does. Of historical interest, but thin gruel. On the other hand, Cat Anderson, who played for Ellington forever, the master of the ear-splitting high squeaks (harmonics octaves above the range), may be really unlistenable. A showman. Too bad. As for Clifford Brown, well, again, influential, but no longer relevant. A reference disc if you buy it. 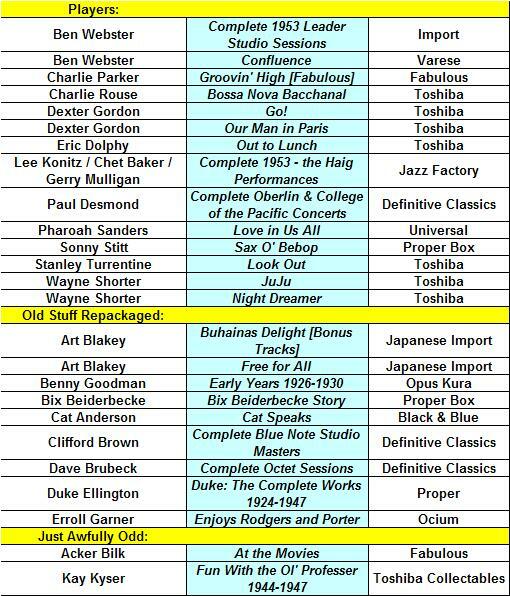 Now the Duke Ellington collection here (Complete Works 1924-1947) would be nice to have. I've got old seventy-eights, and thirty-threes, and a few CD things. This would be a way to save space, and get cleaner sound. Would I listen to it all? Maybe. The others? I've always detested the ham-handed, clumsy but earnest Dave Brubeck. This is no doubt my problem, not his. People find him clever, and he is still immensely popular. I'll pass. Oh well. And I once had a chat with Erroll Garner while we were both waiting for a plane at the airport in Milwaukee. A fine fellow. But again, I'm more a Bill Evans kind of guy. He's fine. But not for me. The last two, the awfully odd? Acker Bilk? The "Stranger on the Shore" guy? The Brit with the wide vibrato and little taste and even less talent. Is he still dead? The Kay Kyser thing might be interesting, Wasn't he "The Pride of High Point, North Carolina?" Anyway, for a kinder and gentler Spike Jones, that might be fun. But I wouldn't buy the thing. Okay. Have I offended everyone?